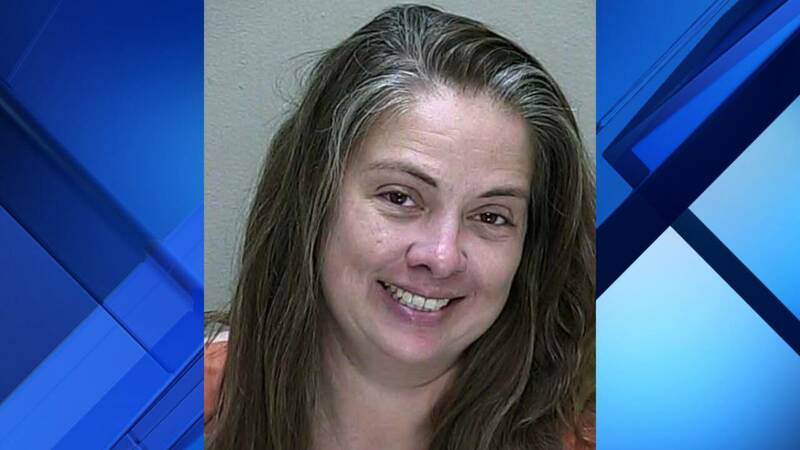 OCALA, Fla. - A mother was arrested on suspicion of DUI after deputies said she hit a curb, exploded her front tire, then almost hit a school bus on the way to pick her children up from school. Deputies were flagged down by a witness, who told officials he noticed a tan Acura weaving in and out of lanes. He told deputies he watched the car almost go down a road the wrong way, according to the report. The witness also stated in the report that he saw the car hit a curb, exploding the front tire, and watched the car continue to drive afterward in an erratic manner -- almost hitting a school bus. The responding deputy noticed the vehicle operating with a flat tire and pulled the car over, according to the report. Erica Akins, 35, was inside the car at the time, deputies said. The deputy said Erica Akins informed him that she was on her way to pick up her children at Lake Weir middle school, but later told him that she was on her way to her job at Circle K.
The deputy informed Akins that her tire was shredded and her rim was scraping the ground, to which she replied, "Even if the tires are flat I can still drive," according to the report. Akins was asked to participate in a field sobriety test and she agreed, deputies said. Akins told deputies she hadn't had anything to drink and had not consumed any illegal substances, according to the report. The deputy administered four field sobriety tests on Akins, according to the report. When the tests were completed, the deputy arrested Akins for driving under the influence due to her performance on the tests, statements and video evidence of her driving provided by the witness, according to the report. Akins was taken to the Marion County Jail, where a breath test was administered, according to the report. Deputies said she blew a .229 and a .222 in their Breathalyzer.